Mehendi party is more of a north indian culture. In south, we do apply mehendi but not in such elaborate designs. We call it "Marudhani" and every house hold used to have a marudhani plant in their own backyard. It had medicinal properties as compared to the curry leaf. The leaves are ground to a paste, finger tips are capped with the paste and small circles are applied on the palms. After 1/2 hour, lime juice mixed with sugar is dabbed in the hands to moisten the dried marudhani. Usually this is done after dinner and we are made to sleep on straw- mattress [Paai in tamil]. The next day is the real fun as there is a big comparison competition of whose hand has attained the most brownish red colour. In Ayurveda, a person who has excess body heat are catagorised as "Pitta", meaning fire [bile that digests and generates energy]. My sister got married in temple, so the function was not an elaborate one. Just a simple gathering of friends and family. After the wedding , we were off to the mandapam were the afternoon traditional kalyana saapadu was served. It was such a delicious spread and not too crowded with items. So we had the time and space in out tummies to relish each and every item that was served. 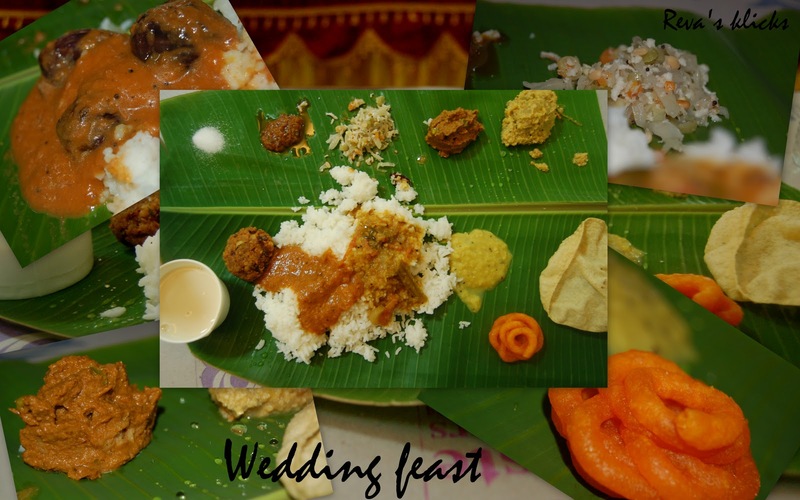 Wedding feast in India is a big business and speaks volumes about the wedding itself. There are chefs who have become celebrities and their menus for wedding are a mile long and every bit tastes delicious. Wedding feast clearly reflects the the regional culture and customs. In India, it is customary to offer food and drink to guests, friends or acquaintances whoever pays a visit to our homes, with or without notice. The same principle is followed here as well. Food that is served during the wedding is way of saying thanks to all the relatives, friends and guests who attended the wedding and showered the newly weds with blessings. At the same time showcasing the local ingredients, tastes, flavours and cooking methods of the region. After all it is a happy occasion where two lives are joined together and we don't want anyone to leave the venue empty stomach. Usually ada pradhaman is not served in Tamil weddings but because of the Kerala influence from my maternal side, my sister's sweet MIL included this in the menu. It was just so delicious as it was made by an authentic Kerala cook. The feast starts with a pinch of salt on the left hand corner, then followed by the pickle, two sweet varieties - one dry and one milky sweet liquid, poriyal, thokku, kootu, vadai and appalam. Only then rice is served. The first course is Paruppu Kadaisal with ghee [similar to tadka dhal], then Ennai Kathirikai Kuzhambhu [aubergine in spicy tamarind sauce], then with Sambhar [dhal flavored with coriander and tumeric], followed by Rasam [watery sour brew loaded with pepper, garlic and curry leaves] and finally Moru [spicy sour buttermilk]. For each course just a couple of mouthfuls of rice is consumed and not more than that. There was a custom when buttermilk was consumed first and then rasam was served in small cups to aid digestion. Pungent:Black pepper, Garlic, ginger, mustard. Astringent: Lentils, tomato, tumeric, cabbage, coriander leaves. Rice is an excellent carrying agent as it blends with whatever stew or sambhar that is added to it and makes us enjoy the taste more. White pumpkin [vellai poosani] has more water content and has a diuretic effect. Ghee and urad dhal [appalam] have cooling effect in our bodies and that is why it is always served in our meals. Usually a bitter tasting dish is not served in such large gatherings as it is considered as disrespectful. So ingredients which have bitter taste like fenugreek, mustard and tumeric are used and consumed. loved reading this post. so much information of your culture and tradition. lovely clicks. Wow .. Reva. Beautifully explained dear. Being in US, I am missing the weddings in India ..
Glad to see that you all had a wonderful time in the mehndi party. The food looks yummy as well. My wishes to ur sister..
Mehandi designs look superb and the kalyanam virundhu is making me hungry. Very informative post..keep writing the good stuff ! Nice write up and fantastic pictures. Beautifully written Reva,being here since a long,seriously am missing all these wonderful wedding ceremonies,hope my younger brother will decide to get marry soon,so that i can live back these wonderful moments am waiting since a long..
Lovely write up Reva..beautifully explained...Lovely clicks! You described the south Indian wedding beautifully. Feel like I have tasted Ur Thalai Vazhai Illai (Virundhu)Feast.Lip-smackingly good.Yumm and interesting read.Luv it. lovely post dear..first time to your blog and enjoyed every bit of it :). expecting your next one ..
Reva, love the mehandi..appreciate the time you took to write about it and share it with us! Best wishes to your sis! was so nice to read this post..enjoyed it..
Wow! Reva, Mehandi hands looks super and i like to read your post so many information of your culture and tradition.All good Wishes to your sister:). Hi Reva,there's an award waiting for U at my space.Feel really honoured if U visit n collect it. Such an informative post along with the fun of the celebrations..wishing ur sis a great married life ahead!! Lovely virundu sappadu- nice post!